Or even the monocle hat thingie? No, it has nothing to do with Zodon’s chair or von Fogg’s silly hat. It has to do with the power of an alien artifact beyond human comprehension! 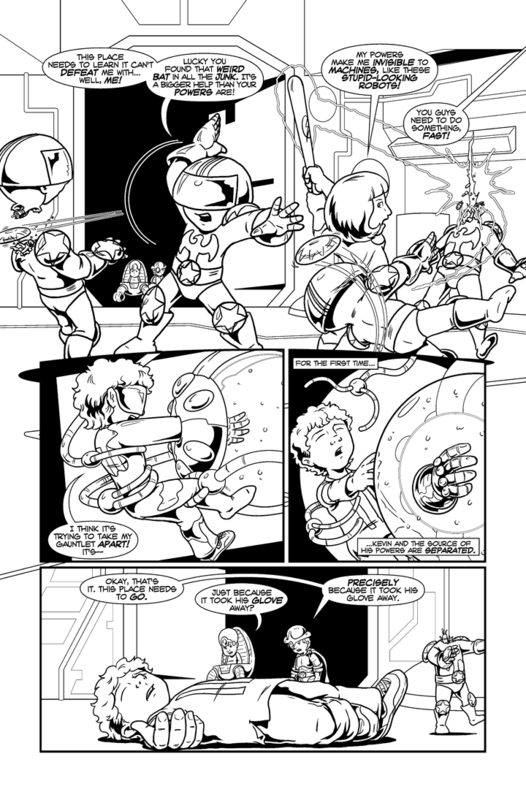 Victor will explain in the next page why what Zodon’s spacestation just did is a Bad Idea. Just keep reading. Eeek! Kevin! I’m unreasonably concerned about this fictional character! Oh, there are much bigger problems with removing the glove than that. Waiting to see what the next page will be. For some reason, in the printed volume that I bought, the next page and the one after it were switched, causing me to become quite confused. i thin its a bigger deal with the emerald gauntlet because during the rain man arc, he mentioned that his family couldn’t do anything about the emerald gauntlet powers and considering we’ve never seen it taken off, i think hes had that thing since forever and it COULDN’T come off. They’ve made progress in defeating all of the Gauntlet’s powers–such as being able to bypass the forcefields. But this is going to be dealt with next issue. Is it just me, or does Victor seem like a lawful evil sort of villain? He’s smart enough to recognize that his interests sometimes coincide with the heroes. In fact, he seems more opposed to Zodon than he is to his more heroic classmates. Well, he can manipulate the other students easily into doing what he wants. Not so much with Zodon. In addition to McBob’s points, Zodon also is his only real rival in the mastermind category and masterminds traditionally ignore all other forms of villain and hero alike as insignificant or at best henchman material. Finally, all of the heroes react to events, Zodon and Victor are the only ones who actually do anything without waiting to be forced into action by outside events.